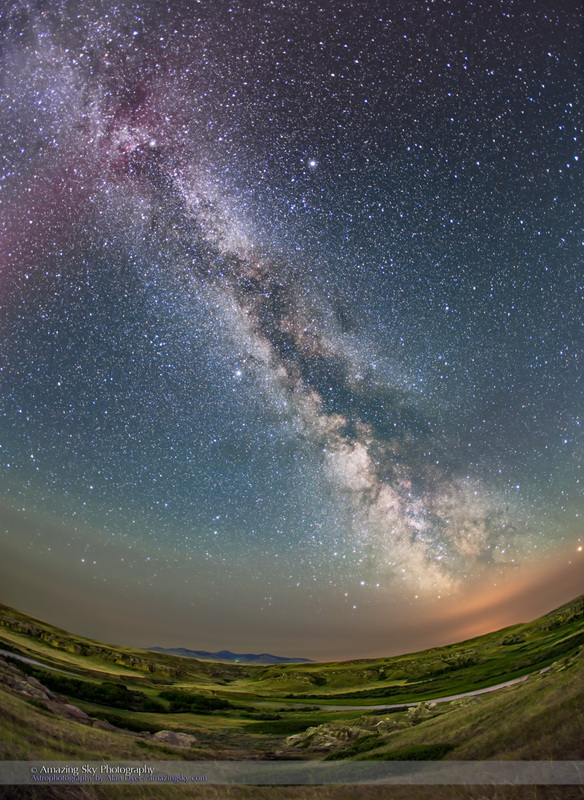 The summer Milky Way shines over the Milk River and the sandstone formations of Writing-on-Stone Provincial Park. Earlier this week I spent two nights shooting at a favourite site in southern Alberta, near the U.S. border. Here, the Milk River winds through a small canyon and coulees lined with eroded sandstone formations called hoodoos. Carved on those hoodoos are ancient graffiti – petroglyphs dating back hundreds of years recording life on the plains. Thus the name: Writing-on-Stone. It’s a beautiful place, especially so at night. I was there to shoot video scenes for an upcoming “How to Photograph the Milky Way” tutorial. And to collect images for the tutorial. 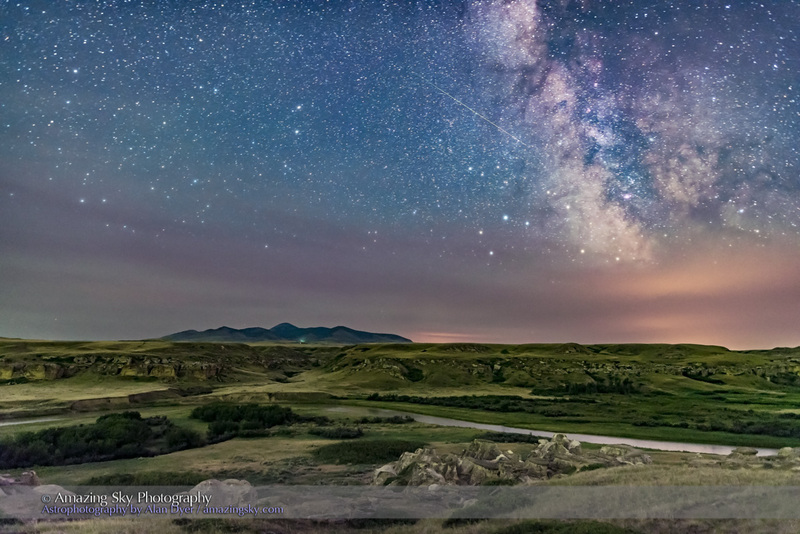 Above is a shot that is one frame from a time-lapse sequence, one that captures a meteor and the Milky Way over the Milk River, with the Sweetgrass Hills of Montana in the distance. This image is from a set of exposures I took with the camera and ultra-wide 15mm lens tracking the turning sky, to prevent the stars from trailing in long exposures. A set of images with the tracker motor turned off supplied the sharp ground. It shows the sweep of the summer Milky Way, with some clouds and forest fire smoke intruding to the south. 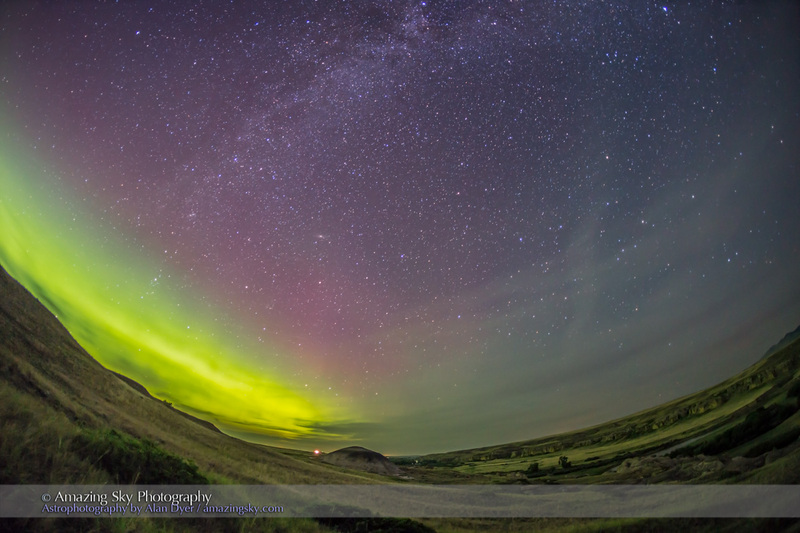 In both images the ground is green because, in part, it is being lit by an aurora display going on behind the camera to the north. Here’s the view looking east, with a green aurora fringed with red lighting the northern sky. The display on the night of July 22/23 formed a classic arc across the north. This was my panoramic view of the vast auroral oval that was wrapping around the planet at far northern latitudes. Here, I was at 49° north, almost on the Canada-U.S. border, and well south of the main oval. In all, it was a magical two nights at a scenic and sacred site. The thin waxing Moon shines near Venus above the colourful clouds of sunset. Tonight, July 18, was the evening of a close conjunction of the crescent Moon near Venus in the evening sky. From my latitude at 50° North, the conjunction was going to be low, and at risk of clouds. In this case, the clouds added to the scene as they lit up with sunset colours. You can see the Moon and Venus at centre, while fainter Jupiter is at upper right, and perhaps not visible on screen at this scale. The location is one I used last month for the Venus-Jupiter meeting, Little Fish Lake and Provincial Park, north of Drumheller. It’s a quiet spot. This Saturday night there were just three families there camping. I shot this telephoto panorama with my red-sensitive Canon 60Da, which is designed to record red nebulas well, but does a nice job on punching up sunsets, too! Alas, the clouds that painted the sky so nicely here, moved in as the worlds set lower. I wasn’t able to shoot them closer to the horizon amid the deep colours of a late twilight. But I’ll settle for this image. It was a full house for my Live from Pluto talk at TELUS Spark! Something a little different from me this time. Not images or time-lapses of scenic places, but of me presenting a lecture and planetarium show! This past two weeks I was immersed back into the world of planetarium programming. Last night, July 16, was the culmination, as I presented a talk and planetarium show devoted to viewing the amazing new images from Pluto and the New Horizons probe … and to taking the audience through the solar system courtesy of the planetarium theatre’s Digistar 5 projection system. The lecture was in the Digital Dome at TELUS Spark, the science centre in Calgary, Alberta. As you can see, it played to a packed “standing room only” house in the dome. The short time-lapse compresses my one-hour lecture into one minute! 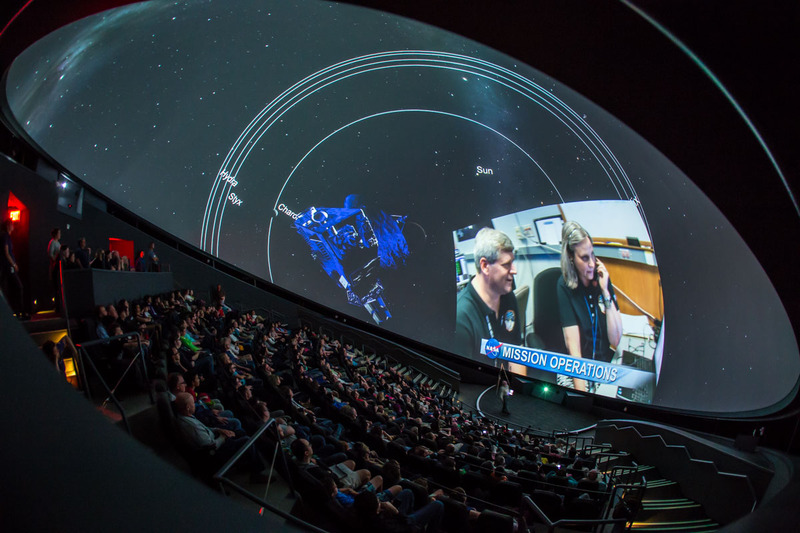 In it, you can get a fast-paced taste of the visuals and immersive scenes I was able to program and project onto the dome with the Digistar. That’s me down front on stage, running the show off the Digistar’s iPad. What a way to present a lecture! I spent 40 years producing and presenting planetarium shows, but these new tools for visualizing the universe in the dome are jaw-dropping. It was fun to get back using them again, to bring this historic flyby event to the public in a unique way. The movie begins with the audience entering, and ends with the Q&A and audience exiting. It includes scenes where we fly alongside New Horizons out to Pluto, then orbit Ceres with Dawn, plus land on a comet with Rosetta and Philae. I shot the time-lapse with a Canon 6D and 15mm full-frame fish-eye lens shooting under Auto Exposure for a total of 1177 frames, taken at an interval of 8 seconds, played back here at 15 frames per second. The camera was behind the dome in the cove, where it would not be disturbed. Music is by Adi Goldstein. Many thanks to the staff at TELUS Spark (sparkscience.ca) for making the event possible. During the week of July 13 to 17 we are witness to a momentous event in space exploration. Here’s how to follow along! During the last week, and next, I’m out of photography for awhile and back into planetarium programming and production mode, my old day-job for decades. What has brought me back to the programming console is the once-in-history exploration of a new world – Pluto by the New Horizons probe. I’m presenting a live public talk at the TELUS Spark science centre in Calgary on July 16 to present the new images. In the talk I use the amazing Evans and Sutherland Digistar digital planetarium system to fly people along with New Horizons as it makes its historic encounter. Here, I present images of some of the full-dome immersive scenes I’ve programmed for the lecture. 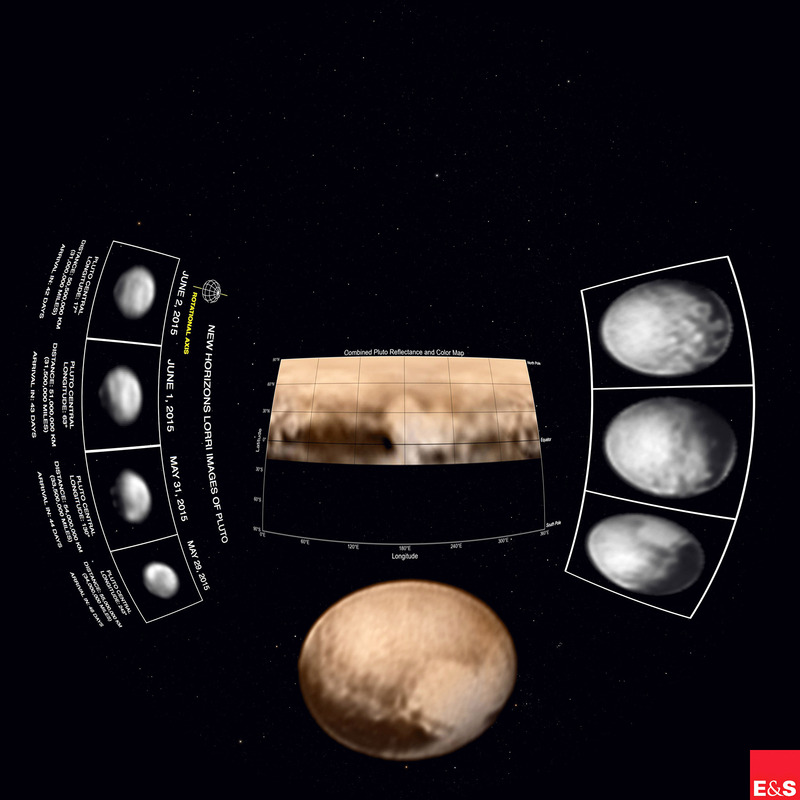 The top image is from the animation that places the audience alongside New Horizons as it flies from Earth and then through the Pluto system. This image is the template scene into which I’ll drop what we hope will be even better images next week. 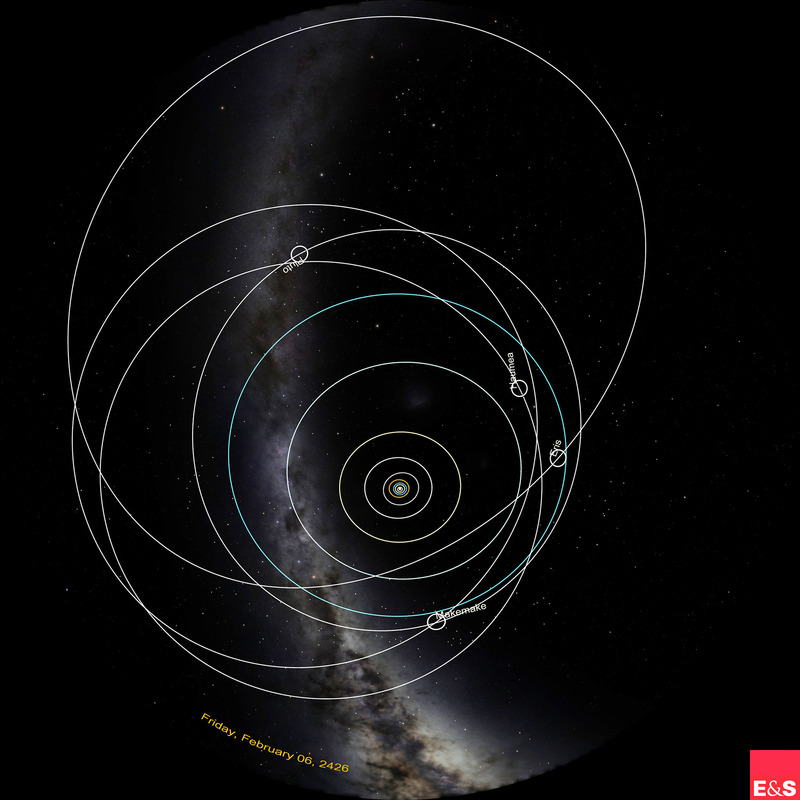 Here we fly out of the solar system to see the orbit of Pluto and its dwarf planet companions, as well as other objects of the Kuiper Belt, in perspective. In this scene we land on Pluto to see the sky as it will appear next week during the encounter, complete with moons in the Plutonian sky. 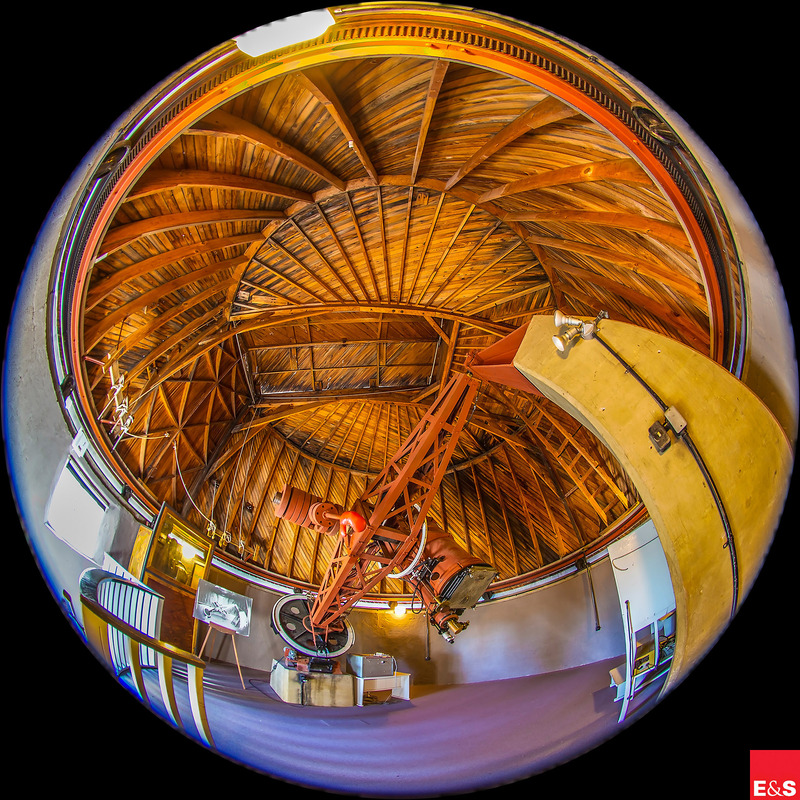 To put the mission into historic perspective I also take people inside the observatory where Clyde Tombaugh discovered Pluto in 1930. 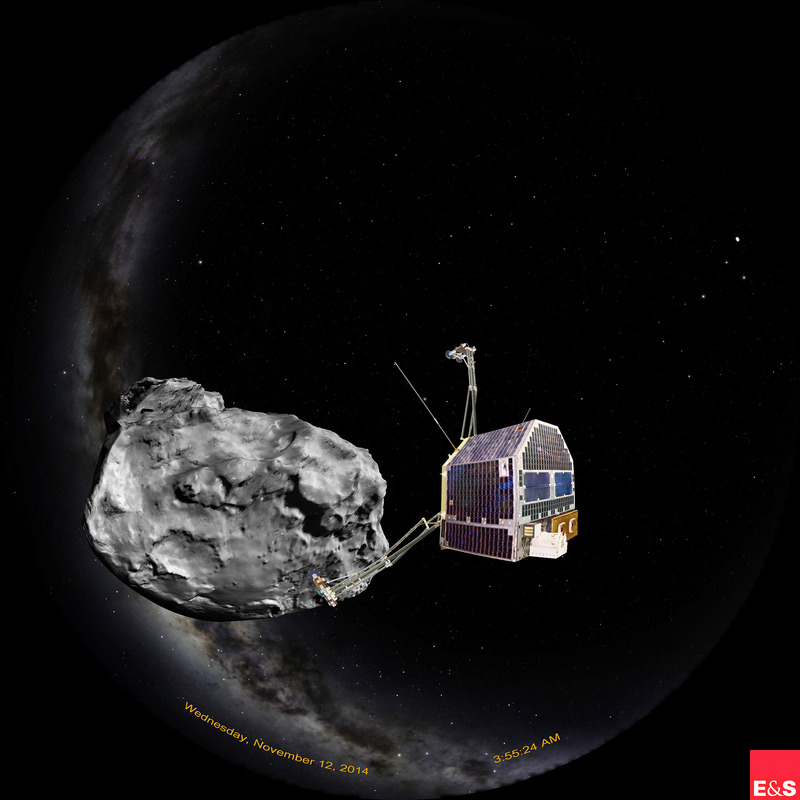 And we’ll also visit dwarf planet Ceres, and fly to the Rosetta comet (above) to watch Philae land, and bounce! For those in the Calgary area able to attend, you can find more details about my July 16 talk at the TELUS Spark website. The talk is in the Digital Dome at 4 pm and is free. 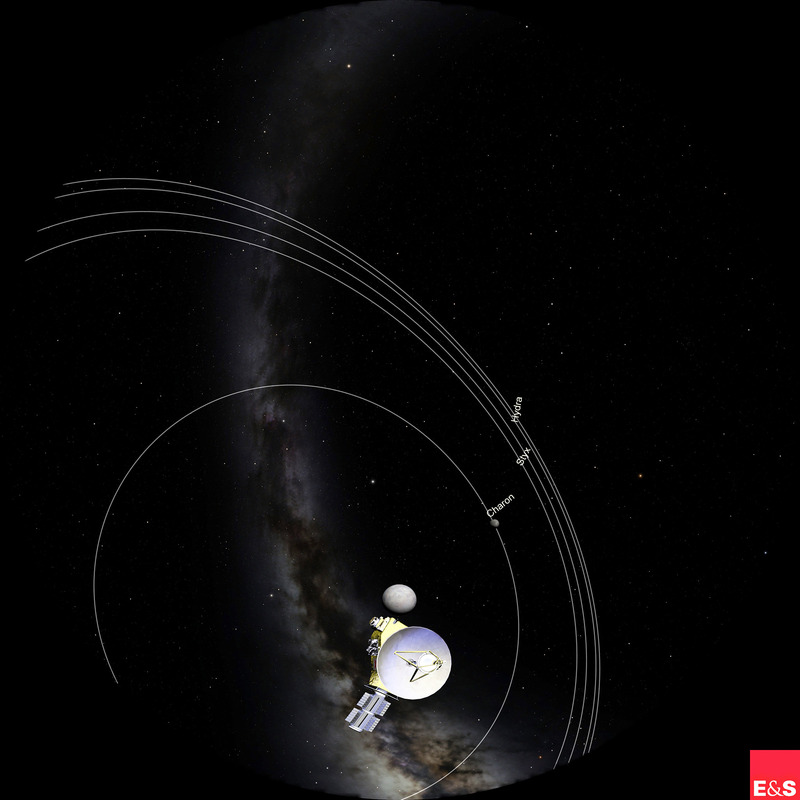 The Planetary Society and Emily Lakdawalla’s blog. This entry provides a detailed schedule of events and image download times. 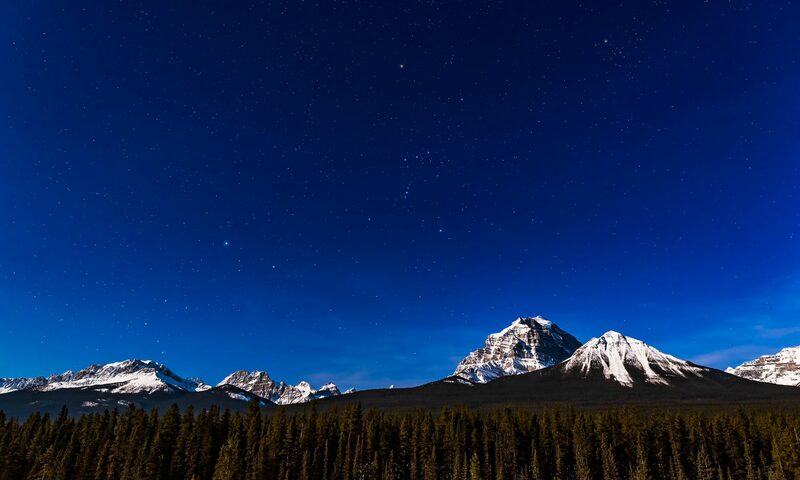 Mountain scenes take on a new look when photographed by moonlight. 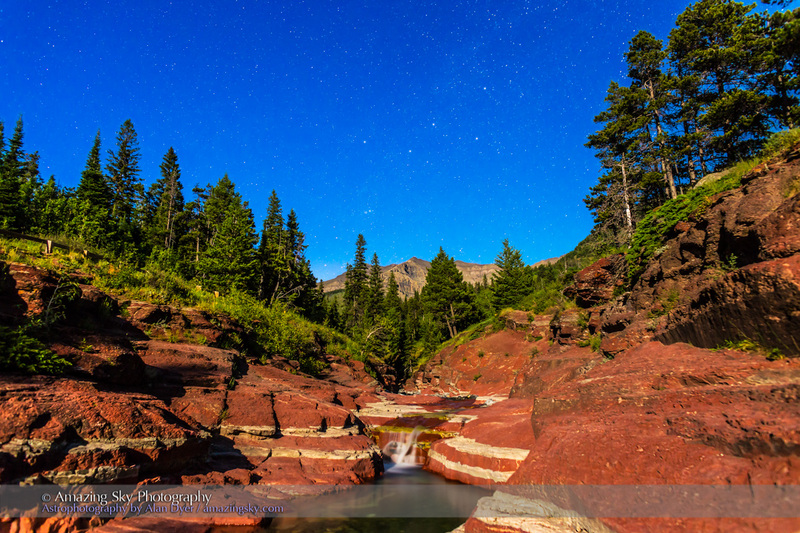 Last week I spent four wonderful nights shooting the landscapes of Waterton Lakes National Park under the light of the waxing Moon. For two of the evenings I taught small groups of photographers eager to learn how to extend their photo skills into the night. We shot at Red Rock Canyon both nights, an ideal spot for its many composition options for shooting both toward and away from the Moon. 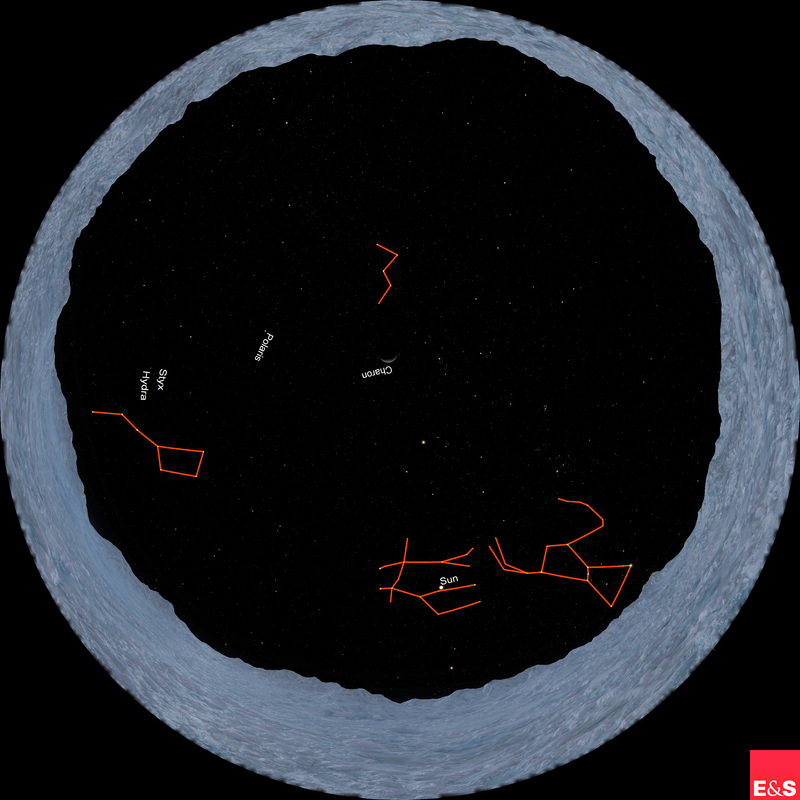 The lead image is a view looking up the canyon, with Cassiopeia in view. Always nice to have a recognizable constellation so well positioned. The image just above looks toward the Moon, partly hidden by colourful clouds diffracting the moonlight. A student is at left trying out a composition. 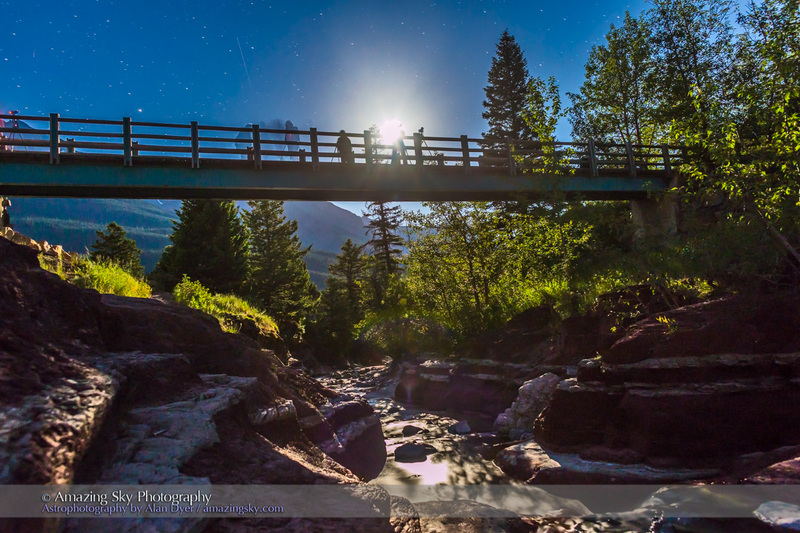 Here, students, silhouetted by the Moon, use the footbridge as their vantage point to photograph moonlight on the canyon waters and walls. My workshops were part of the annual Waterton Wildflower Festival. So, a number of us tried to shoot flowers by moonlight, no easy task considering the wide apertures and shallow depth of field usually required, even under bright moonlight. 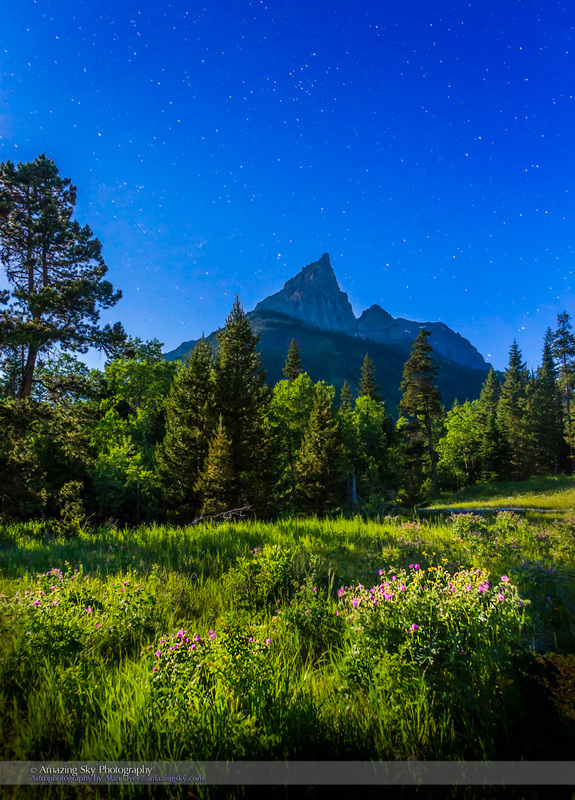 But the photo above is my take on summer alpine flowers in a meadow with the iconic Anderson Peak in the distance. Three nights were wonderfully clear. But my first night, set aside for scouting locations for the Workshops, was beset by some clouds. However, I made use of them to create a moody moonlit cloudscape panorama of the Big Dipper over Blakiston Valley. I’ll be back in Waterton in September for the Wildlife Festival. We won’t try to shoot bears by moonlight! One did wander by at the start of our Saturday Workshop! Instead, we’ll concentrate on photographing the Milky Way. That’s Friday, September 18. Happy Canada Day! From one of the most scenic places in the country. I spent a wonderful four days and nights last week at Waterton Lakes National Park, Alberta, with near perfect weather conditions. 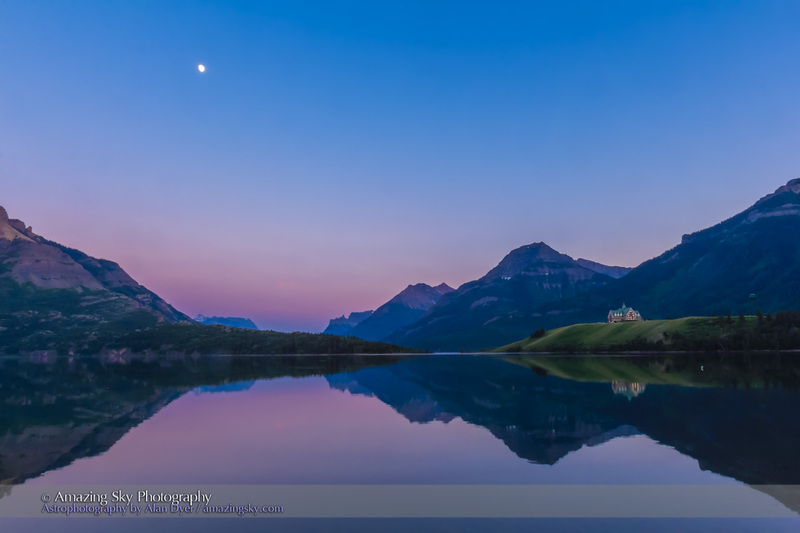 For one, the infamous winds of Waterton weren’t blowing, allowing me to shoot the iconic Prince of Wales Hotel reflected in the calm waters of Middle Waterton Lake at Driftwood Beach, with the waxing Moon above in the twilight sky. Earlier in the evening, I was at the Maskinonge Overlook shooting some video for upcoming tutorials. 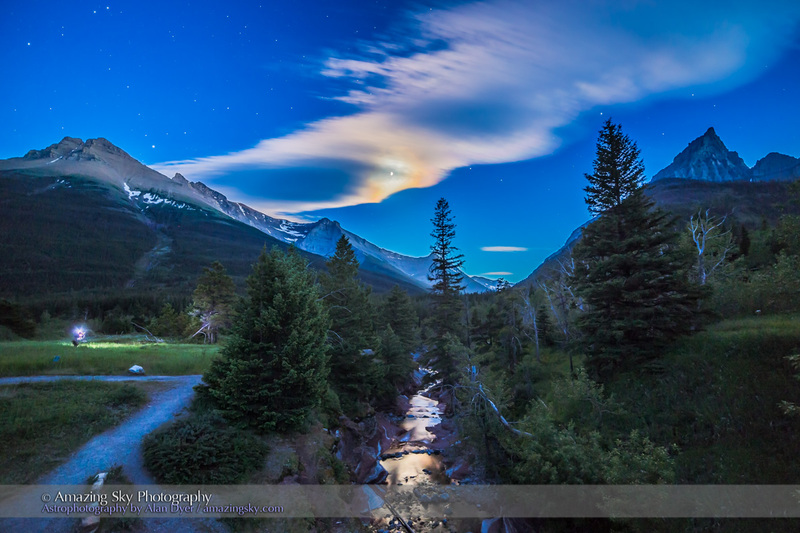 At sunset I shot this image, below, of the Moon above the alpenglow of the last rays of sunlight. 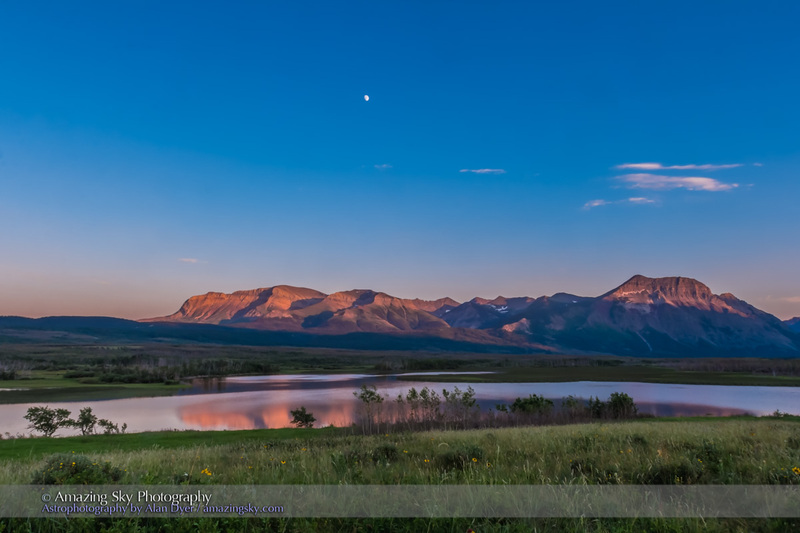 The rising waxing gibbous Moon in the sunset sky over Maskinonge Wetlands at Waterton Lakes National Park, Alberta, June 2015. The last rays of sunset are illuminating the peaks in alpen glow. This is an HDR stack of 3 exposures with the Canon 60Da and 16-35mm lens. And don’t forget to look west for the ongoing Venus-Jupiter conjunction. I missed the best night last night, June 30 – clouds! But here’s hoping for tonight.